With a population of more than one million and covering over 42 square miles, the Bronx is a vibrant part of New York. The Bronx was given its name in 1898 when the new borough was named after its single largest geographical feature : The Bronx River. 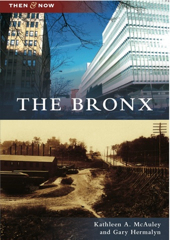 The Bronx: Then and Now showcases the borough's rich history in a personal way through vintage and contemporary images. Comparing our present to our past is how we understand our history. Arcadia's Then And Now series makes such local comparisons available. Books in this series offer a special view of American life by placing historical images side by side with contemporary photographs.